This week as the family separation issue continued to grow, Catholic Charities USA, President and CEO, Sister Donna Markham OP, PhD made a solidarity visit to Catholic Charities of the Rio Grande Valley, to see first-hand the impact the family separation policy is having on children and their parents. 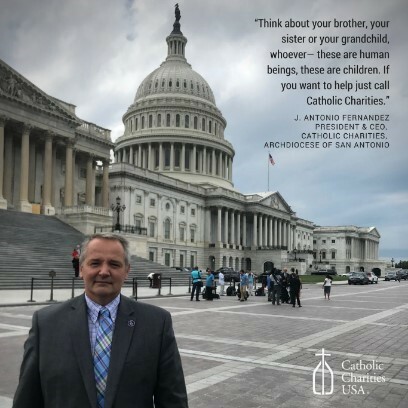 At the same time, J. Antonio Fernandez, President and CEO of Catholic Charities for the Archdiocese of San Antonio joined a congressional briefing with other experts on family separation to remind congress of the human toll the policy is having on children. On Wednesday, President Trump signed an Executive Order (EO) that revises the widespread use of family separation at the southern border. While a welcome first step, agencies and families impacted by the executive order still need your help to reunite families. Here are four things you can do to help! Learn More: To learn more about Family Separation, visit the Justice For Immigrants (JFI) “Family Separation Webpage” to review backgrounders, educational material and a webinar.